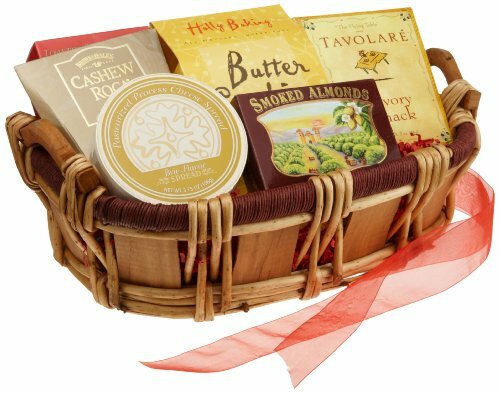 "A little bit of sweet combined with a little bit of savory makes this gourmet food basket a wonderful medley for the holidays, a special occasion, or just because you care. On the sweet side we've included peppermint crunch popcorn clusters, traditional butter cookies, and cashew roca. On the savory side, there's Brie-flavored cheese with toasted sesame crackers, Bavarian style dill pretzels, smoked almonds and a savory snack mix."